A smartphone app designed to locate potential phone thieves did just that for a Queens woman when a man robbed her of her iPhone Monday night. The 31-year-old woman told police she was walking on Liberty Avenue in Jamaica at about 8 p.m. when a man in his 20s bumped into her, reached into her front right pocket and took her black iPhone 4. The thief then took off, running away in an unknown direction. But the robbery victim had a security application on her iPhone designed to catch thieves and recover the phone. The unauthorized iGotYa app takes a photo whenever someone enters the wrong passcode at the locked screen. 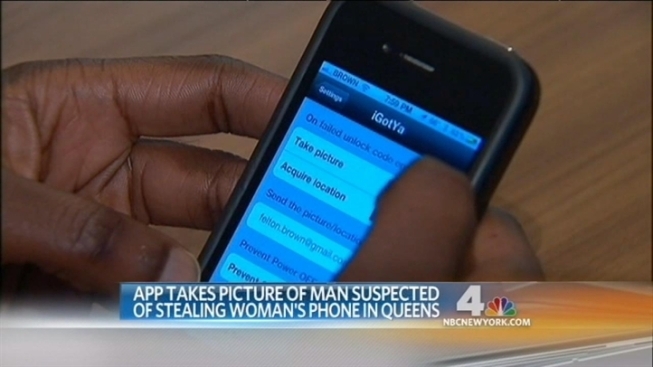 The thief's photo was emailed to the woman, who brought it to police and told them it was the man who stole her phone. The iGotYa app is accessible only on "jailbroken" iPhones, which allow users to download apps not approved by phone manufacturer Apple. Users download such apps at their own risk. Anyone who recognizes the man pictured is asked to contact Crime Stoppers at 800-577-TIPS or nypdcrimestoppers.com.